Glover Teixeira was in trouble of losing his title shot after Jones went life and death with Alexander Gustafsson in his latest title defense. After the fight, both fighters received positive responses and MMA fans started to ask for an immediate rematch. It was just last week when the rematch talk has ceased after Dana White announced in ESPN that Jones has elected to defend his belt against Glover Teixeira. The Brazilian was promised a title shot last September when he knocked out Ryan Bader in the first round. He is now on a 20 fight winning streak and has not tasted defeat for almost 9 years. His last loss was handed to him by fellow UFC fighter Ed Herman in his fourth professional fight way back in 2005. In the supporting bout, Mir and Overeem will be looking for a win to stay relevant and avoid a possible cut from the promotion. Mir’s last victory came almost two years ago when he broke the arm of Antonio Rodrigo Nogueira. He lost his next 3 fights after that win. 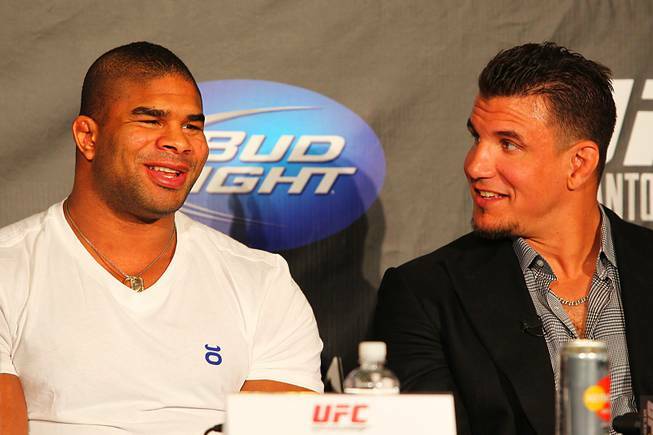 His opponent, Alistair Overeem is also looking to snap his losing streak. The fearsome Dutch striker has been in line for the heavyweight belt after his first round destruction of Brock Lesnar in his octagon debut. He was sidelined for more than a year after that fight for failing the post-fight test. He returned to the octagon early this year and lost to Antonio Silva by TKO in the third round. Overeem was dominating that fight before Silva caught him with a right straight and finished him up with punches. He also lost his latest fight to Travis Browne in similar fashion. He almost finished Browne early in the round with vicious knees in the clinch but the Hawaiian recovered later and landed a front kick that knocked out Overeem.